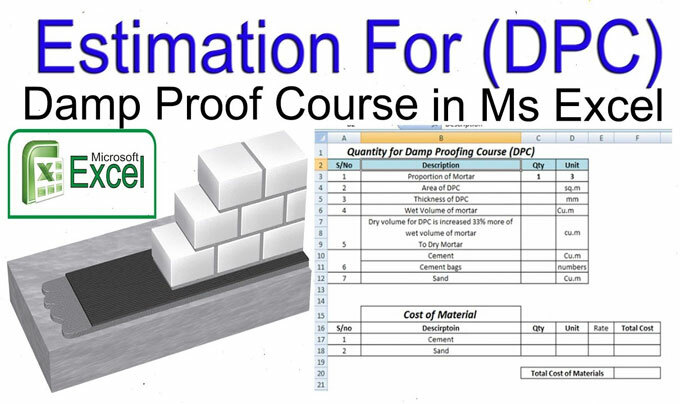 This construction video will guide you to determine the quantity of damp proof course (DPC) with the use of excel sheet. Damp proof course (DPC) is normally used at basement levels which control the action of moisture via walls and floors. 1. It should be watertight. 2. It should be strong and long-lasting. It should have the ability to resist both dead and live loads without damage. 3. It should be dimensionally consistent. 4. It does not contain melted salts like sulphates, chlorides and nitrates. Serial number, description, quantity and unit of measurement. In description section, there are different types of heads like proportion of mortar, area of DPC, density of DPC, wet volume of mortar, dry volume for DPC is raised 33% more of wet volume of mortar to dry mortar.. The second table is intended for finding out the cost of material. In the second table, the following records are included serial number, description, quantity, unit, rate, total cost. To learn the complete calculation process, watch the following construction video tutorial.